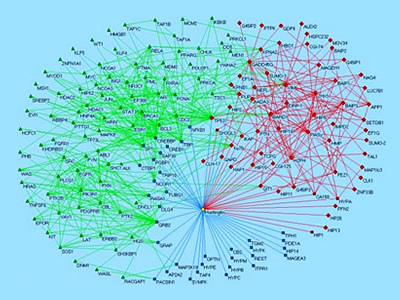 This graph is a view of a protein-interaction-network in Huntington's disease (HD). As the authors explain: Within the last two years we have applied the automated two-hybrid system for the identification of protein-protein interactions involved in HD. Using this method, a network of protein-protein interactions involved in Huntington's disease including 188 protein-protein interactions were found (left images). Protein interactions were verified by in vitro binding experiments, co-immunoprecipitations and co-localization studies. The network permitted the functional annotation of 16 uncharacterized proteins and lead to the discovery of GIT1, a G protein-coupled receptor kinase interacting protein, crucial for Huntington's disease pathogenesis. Currently, the automated yeast two-hybrid system is used to identify the partner proteins of human disease proteins. 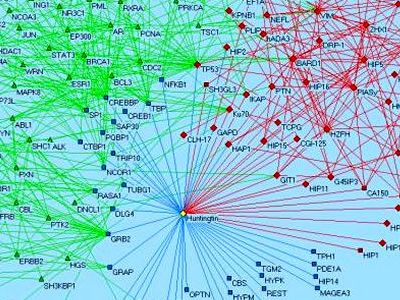 We propose that the understanding of protein-protein networks of human diseases will help to identify novel targets for therapeutic intervention.